Friday October 26 from 4 to 6 p.m.
Come check out our hybrid structure now just a few months from completion. 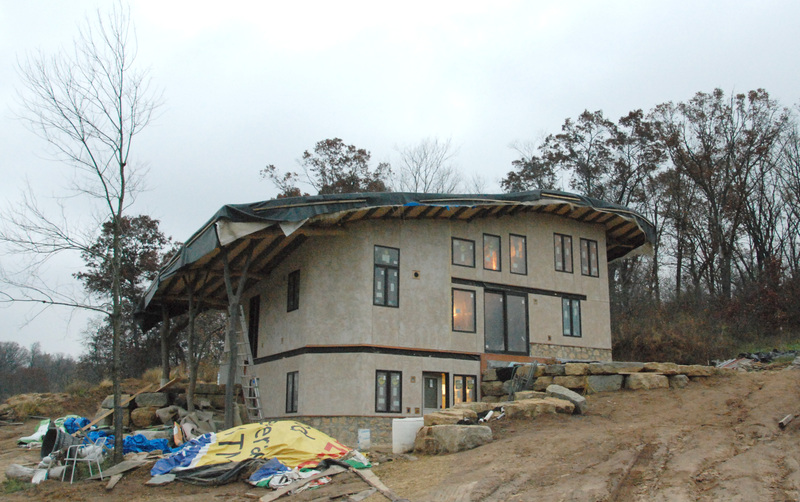 We are melding classic building practices like straw bale, plaster stucco and unmilled timbers with cutting edge materials and technology – using local materials where possible – to create a home that will be comfortable, durable and extremely energy efficient. Passive solar design. See my post How Much Passive Solar Heating Do You Want in a Warming World? I am a carpenter/engineer in Australia, and wanting to develop some techniques using un-milled timber like the structure of your house. The US seems further a long at this and i was just wondering/hoping if you could point me in the direction of some information or resources you or your building council used to check the design? Best wishes with your project. We love our home.